Challenge: Andean Magic Art (AMA) Jewelry is a socially responsible jewellery company in Cusco, Peru. It hires poor, unskilled workers and gives them free training to transform them into skilled artisans with a better chance at life. I answered an opportunity to volunteer at AMA Jewelry for three weeks and help it tell its story to Western tourists. Implementing a Solution: I interviewed the owners and artisans (via a translator) and took photos. From these interviews and existing brochures, I developed a value proposition with key messages to emphasize the company’s differentiators, including the apprenticeships it offers to some of Peru’s poorest. I integrated these messages, with new photos and the artisans’ personal back stories into a cost-effective WordPress website, with an interface that toggled between English and Spanish. A couple of Trip Advisor reviews reference the website. 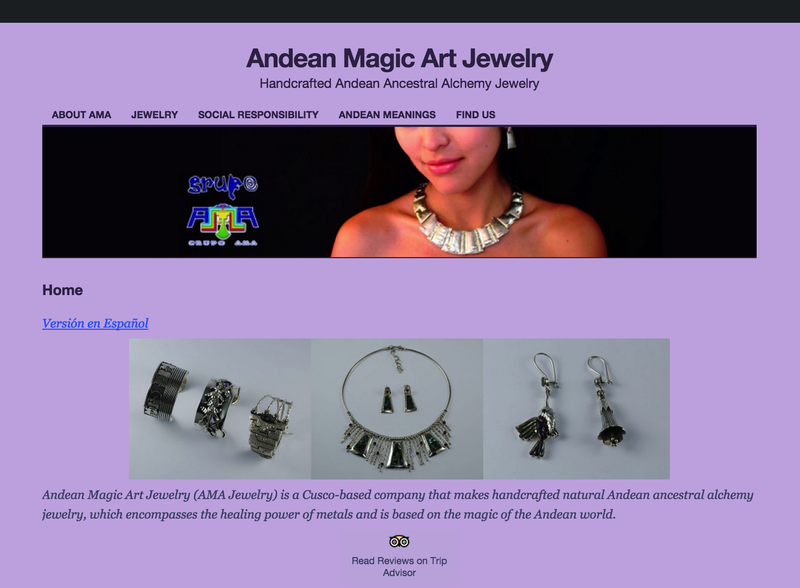 I also repurposed this content in: a revamped script for its face-to-face workshop tours; a new profile on Trip Advisor and a revised Facebook page, which featured short messages about AMA Jewelry’s pieces and their Andean meanings. Results: AMA Jewelry is thrilled with its new website and credits it for enticing several tourists to visit the store, who wouldn’t know about it otherwise. Some reviews on Trip Advisor have even noted the website and how it helped explain AMA Jewelry’s work.